(LOCATION: Coral Gables FL) The Bertram 46 Convertible is a legendary fishing machine. One of the most popUlar convertibles ever designed she dominated the market for over a decade. This is a serious fisherman with flybridge, well equipped cockpit, and upscale interior. The flybridge features a custom hardtop with Eisenglass enclosure, 6-rod rocket launchers, spreader lights, and Rupp double spreader outriggers. The centerline helm station has dual captain's chairs and electronics package with Garmin 3210 GPS / radar / color sounder, Simrad autopilot, and Icom VHF radio. There is guest seating forward. A ladder takes you below to the large cockpit. The spacious cockpit gives you more than enough workspace, and includes cockpit awning, six rod rocket launcher, eight flush mount rod holders, prep station, tackle center, transom fishbox, in-deck Lazarette, bait freezer, and transom door. There is in-deck access to the Onan genset. Wide side decks lead forward to the foredeck with aluminum bow rail, bow pulpit, anchor, and electric windlass. The salon is large, open, and comfortable. Port side we have a full sofa. Forward is the entertainment center with television, VCR, and stereo. A starboard credenza provide accessible storage. The salon has large windows for natural light and wood blinds for privacy. There's plenty of room in the salon to relax after a day of fishing, discuss the ones that got away, and enjoy a cold beverage. The galley is down with Princess electric range, Kitchenaid microwave oven, Kenmore stand-up refrigerator, Corian countertop, stainless steel sink, and teak & holly sole. For overnight and extended fishing trips there are two staterooms. Forward is a master stateroom with island queen berth with under-berth storage, hanging locker, private head, Panasonic TV, and teak & holly sole. A guest stateroom has upper & lower bunks, dual entry head compartment, hanging locker, drawer storage, and teak & holly sole. Comfortable accommodations make the fishing all the more enjoyable. Performance is provided by twin Detroit Diesel engines generating 735 horsepower each with a cruising speed of 20 knots and a top speed around 25 knots. Overhauled in 2014 they have 150 hours of use. An Onan generator provides offshore electrical power and three CruiseAir HVAC units maintain interior comfort. 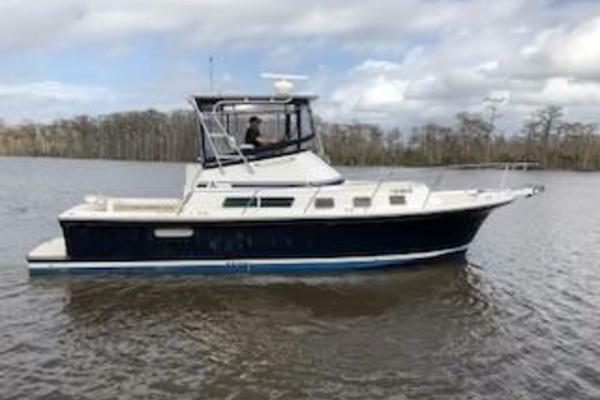 If you are serious about fishing or just want to look like your are, call now for more information and schedule a showing of this classic 46' Bertram Model III Convertible. The Bertram 46III Convertible is truly a high-powered performer built to smooth pounding waves down to size. Notoriously popular as a fishing machine, she's also ideal for weekend cruising. There's a queen-sized walk-around berth forward, real oak throughout the interior, and a long list of accoutrements.